Acosta’s White House credentials have now been revoked. As they should have been... besides the unbelievable disrespect, he physically wrestled the mic from the girl who was running it around the room and did it twice. He should have been escorted out on the spot. While I find his refusal to relinquish the mic disrespectful and boorish to the intern, after watching the video on FOX several times, he cannot be described as “ physically wrestling “ for the mic. OK, he didn't "wrestle it" away, he pushed her away [like a spoiled child] several times... Either way the actions of the WH were easily warranted. Sessions firing a constitutional crisis. Not sure why. About time is my reaction. Don't you wonder why the president has been so concerned about Mueller? How concerned has he been? Almost two years, with no spending limit, no limit on the scope of the investigation, and yet, no proof of Russian collusion, no evidence of obstruction. Tax cuts, trade deals, booming economy, lowest unemployment levels, yeah,Trump seems concerned. His only missteps, have been appointing, do nothing, people. Sessions, is a swamp dweller, who has proven to be a useless, entity. Apparently a LOT! Have you not noticed the number of claims of "no collusion" or of complaints about Sessions' recusal even though Mueller has made no suggestions about collusion or obstruction YET? And have you noticed the background of the new Acting AG? No(? ), well then welcome to planet Earth! Not saying there was "collusion" but if there was what statute would have been violated? Is collusion illegal? Are you really claiming that you don't see that the investigation was nothing more than Democrats playing politics with the FBI? The whole darned thing was a scam to make Trump look bad from the start. If you don't see that, you are the one with his head stuck in the sand. The indicted Russians are irrelevant and a joke. Indicting Russians almost got Mueller in trouble when *) One org responded, and did not exist at the time, and *) One org responded and demanded discovery. Oops. This may still bode ill for him. General Flynn will not spend one second in prison. Papadopoulus is withdrawing his guilty plea, and is about to blow those behind the fake dossier apart. Manafort's in the news about something, but I'm not interested. 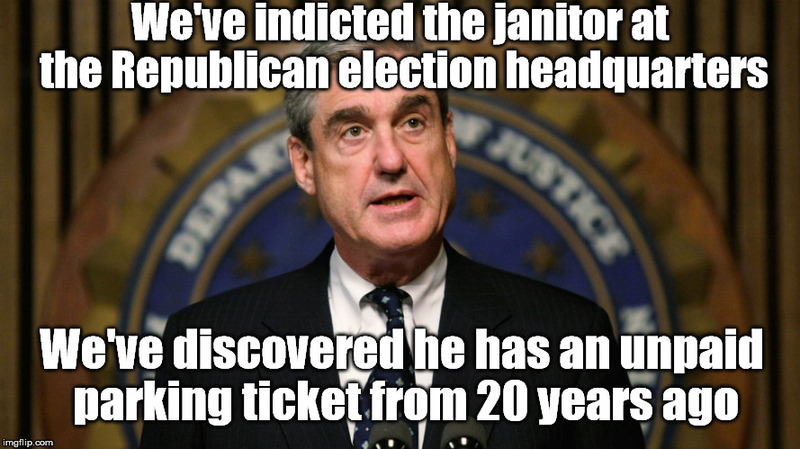 Something about causing Mueller more problems, even after pleading guilty to the first set of charges totally unrelated to muh Russia, for leniency in the next set of charges, or something like that. The judge is not happy with Mueller. New Acting AG will be very busy. The SpyGate investigations are complete, now the indictments proceed. Russia has tried to influence our elections for decades. The US does the same.